For the second year in a row, al Qaeda released a videotape rallying its supporters near the anniversary of the Sept. 11 attacks, and experts were investigating if the images of the terror network's No. 2 leader were new or not. In the tape, broadcast Thursday by the Arab television station Al-Jazeera, Ayman al-Zawahri proclaims that the United States will be defeated in Iraq and Afghanistan. 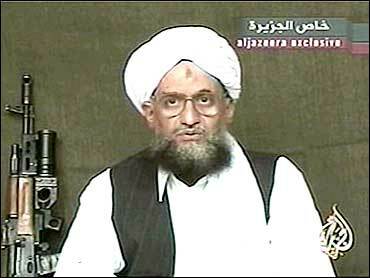 A bearded al-Zawahri, wearing eyeglasses, a white turban and a black vest over a white shirt, looked into the camera as he spoke. An assault weapon was propped against the wall behind him. "The defeat of America in Iraq and Afghanistan has become a matter of time, with God's help," al-Zawahri said on the tape. "The Americans in both countries are between two fires, if they continue they bleed to death and if they withdraw they lose everything." U.S. forces face fierce resistance in parts of Afghanistan and across Iraq, but military commanders insist they maintain the upper hand against insurgents in both countries. Pakistani army spokesman Gen. Shaukat Sultan, whose forces staged an offensive against al Qaeda and Taliban remnants in the border region with Afghanistan this week, said the tape was likely aimed at "boosting the morale of the terrorists who have suffered heavy casualties." President Bush's national security adviser, Condoleezza Rice, said Friday in a televised interview that the tape would be examined to see if it's authentic. "These tapes do appear from time to time. They have appeared on the anniversary of 9/11, so it would not be surprising if this is indeed a tape from the al Qaeda leadership," Rice said. The tape, she said, is a "reminder that al Qaeda remains a threat." Al Qaeda leaders, she said, "are sitting in a cave making these tapes. It's a lot more difficult but they are still a very dangerous organization." Secretary of State Colin Powell echoed that belief Friday, telling the Associated Press he believes bin Laden is still alive, although he said he has no proof of that. His al Qaeda network is decimated at top levels, Powell said. "It does have the capacity to regenerate itself," Powell said of al Qaeda. But any future leaders are not as accomplished nor as experienced as "those who have been taken out" in the U.S. campaign that overthrew the Taliban regime in Afghanistan and the subsequent hunt for al Qaeda operatives, Powell said. "I don't know where he is," Powell said of bin Laden. "I don't know his state of health. I believe he is still alive, but I can't prove that. He clearly is in hiding and he is on the run." Judging from reaction on Web sites known for militant Muslim comment, those who share al Qaeda's view of the United States as the enemy of Islam found reassurance in al-Zawahri's appearance. "God is great, how beautiful is Sheik Ayman's face," wrote a contributor to one of militant web sites on Friday. "Thank God, who alleviated our worry, and pleased the heart and showed us these bright faces, after we've been seeing the faces of the oppressors and hypocrites, day and night." Al Qaeda has issued an audiotape from bin Laden in the two previous years on Sept. 10. If the latest tape is from al-Zawahri, it would be the first time since December 2001 that bin Laden's No. 2 has appeared in a video in which he is speaking and delivering a message, the official said, although he was purported to have made a statement in an audiotape on June 11. Al-Zawahri also was shown making a limited statement on a videotape on April 15, 2002, but Defense Secretary Donald H. Rumsfeld said at the time that the material appeared to be outdated. Experts were investigating what message the video might be seeking to convey and whether the videotape is actually an older audiotape, now joined with its images. In the latest tape, al-Zawahri makes a rare appearance without bin Laden, proclaiming that the era of security for Americans is over and they will never enjoy it again unless their government stops what he described as crimes against Muslims in Iraq, Afghanistan and Palestine. He also warned of plans to tear apart the Arab and Islamic worlds, saying that includes the Arabian Peninsula, Egypt and Sudan, particularly the troubled Darfur region where conflict has raged for 19 months. Al-Jazeera's presenter said the reference to Darfur, which has drawn recent international attention with criticism of the Sudanese government's handling of the crisis, indicates the tape is new. U.S. officials have noted that some tape releases have preceded terrorist attacks. In April 2003, a taped voice thought to be bin Laden's exhorted Muslims to rise up against Saudi Arabia and called for suicide attacks against U.S. and British interests. Suicide bombers struck Western housing compounds in the Saudi capital on May 12, killing 26 people. U.S. officials caution that not every tape is followed by an attack, but as CBS News Correspondent Jim Stewart reports, they believe it is no coincidence that this tape was released just before the third anniversary of the Sept. 11 attacks — a mocking reminder that the men who planned it are still free. An expert on Islamic militants said al Qaeda's "annual message" is meant to show the terror network has "no problems and, as al-Zawahri said, they see themselves as winning." "The message every year has a different meaning, but always makes the point to prove their existence and the ability to continue," said Dia'a Rashwan of Cairo. "They are saying they can still make tapes and videotapes and say whatever they want." Bin Laden and al-Zawahri are believed hiding along the Afghan-Pakistan border.